White leather creeper shoes with a 2 inch platform. The Creeper-402 has the standard D-Ring lacing with a black interweaved toe. They also have a hidden coffin compartment in the sole of the shoe. I love them. They are comfortable, fit true to size and not as heavy as I expected but I feel like the quality is lacking. The black line around the front part of the shoe is coming off and the inside heel part is also peeling. This could also be that I slip the shoes on without undoing the laces. I find that creepers from T.U.K. are of much better quality and are more well made. The reason I got these are because of the secret compartment. Overall, it's a great shoe but I the quality could be better. I got these shoes just 10 minutes ago, they are real cool. they're like stompers. But lightweight. 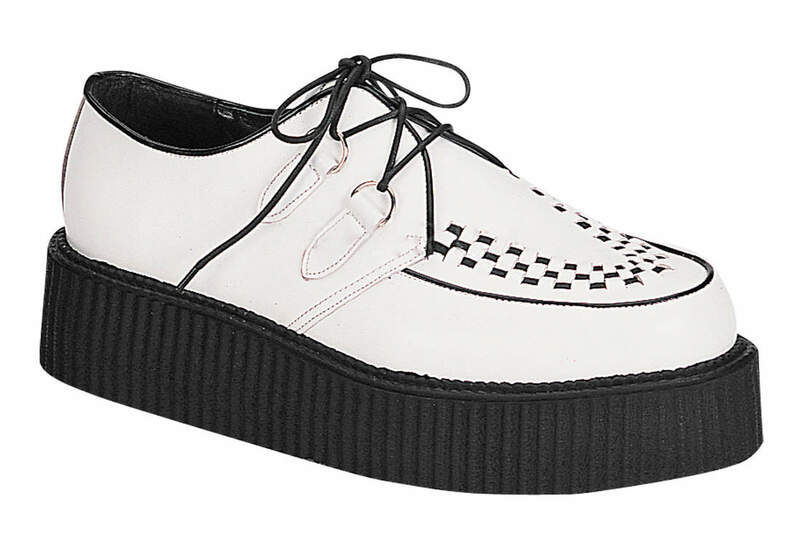 These creepers just make a statement. I absolutely love them.